As I have written quite a few blogs about nearshoring IT to Eastern and Central Europe I thought this contribution from a nearshore firm would be interesting to share. It is a mini-report on nearshoring to Central and Easter Europe. It is good to get the views of somebody working in the industry in the region being reported on. “A tale of the 21st century hero, who had outsourced his own job to China, while keeping most of his salary, has recently put outsourcing in the spotlight. While companies have been transferring their jobs abroad ever since ancient Romans decided it was better to do most of their agriculture in regions where labor was cheaper (like Egypt), this case marks a brave new chapter in the history of outsourcing. Why am I mentioning it? Probably because it shows us that outsourcing landscape changes rapidly. One of those changes is the growing importance of outsourcing to Central and Eastern Europe (CEE). Just one country of this region – Poland – saw its technology outsourcing business grow by 20% annually since 2008. There are many reasons for this. The costs of outsourcing to traditional locations, such as China and India, exploded in recent years. To give you just one example: according to this article, in 2005 companies from US could save close to 50% manufacturing their wares in China, including taxes and transport costs. Due to rising salaries and appreciation of Yuan, in 2012 they could only save 18%, and many chose to move production back to their own country. And by 2015 manufacturing in China will be just 9% cheaper than stateside! Remember – we’re talking about unskilled and semi-skilled labor. The price of Chinese IT outsourcing grows even faster, and is starting to match the costs of many CEE countries. With smaller price differences, all the other small benefits start to work in favor of CEE. Central European countries are technologically-minded, with strong average English skills. They share a similar work culture to people from US and Western Europe. They’re just about far enough to get your outsourcing a bit cheaper and just about close enough to save you from 3AM business calls. They’re easy to get along with, and that’s much more important, than it sounds, as many offshored projects fail due to simple communication issues or cultural misunderstandings. There are many other smaller conveniences related to outsourcing in CEE. You can save quite a bit on business flights. Legal and financial issues are much simpler, as many of those countries are EU members. CEE also has multiple cities with higher education facilities and good infrastructure, where real estate is affordable. Still, the data that paints the brightest future for Eastern European IT outsourcing market is the raw comparison of supply and demand. Even though employment in IT sectors of western EU rose from 2.25 million in 1995, to almost 5 million today, it’s still growing and creating demand that can’t be met by local workforce supply. A study founded by the European Commission of Enterprise and Industry paints a picture of upcoming deficiencies of IT workforce in old EU countries. As seen in this comparison, by 2015 top six job markets of EU alone will need 250 000 extra employees with IT skills. This does not account for the needs of all the smaller markets or companies from US and other regions of the world. Where will they find a quarter of millions of skilled workers? Mostly in Central and Eastern Europe. The data from 2012 shows that companies from Germany, UK, Austria, Norway, Sweden and Netherlands most frequently opted to move their services to nearshore locations, rather than somewhere offshore. What’s also interesting, is the resurgence of the so-called backsourcing. A rising number of EU companies that have outsourced their processes offshore, choose to return to nearshore markets, pumping up the Eastern outsourcing sector even further. One important reason of this outsourcing push is a huge, untapped reserve of well-educated, affordable workforce in CEE countries. While Communist governments left the Eastern bloc in political and economic disarray that lasted all through the 90’s, and is sometimes felt to this day, they also created a legacy of well-developed technological universities that were quick to embrace the system change. When faced with hardships of their job markets, young people in CEE countries chose to pursue further education more often than their peers in Western countries. Pearson plc, an education company that compares the Global Index of Cognitive Skills and Educational Attainment in 39 developed nations, confirms strong educational position of the CEE region. Many CEE countries show better student test scores and graduation rates than their richer Western partners. As we’ve already established, salaries are another important driving factor that helps the CEE outsourcing grow. The average gross monthly salaries in CEE range from $379 (Ukraine) to $1222 (Czech Republic). By comparison, the average monthly salaries in top European job markets start at $2589 (Italy) and go all the way up to $4932 (United Kingdom). As mentioned at the beginning of this article, costs in many traditionally cheap outsourcing locations are no longer that competitive. In particular, China now offers similar costs to CEE, mostly due to growing life standards and huge demand. Let’s take a look at specific countries, and their unique strengths, according to a series of reports published at the end of 2012 by Jones Lang Lasalle company. Poland is currently the leading market for outsourcing in Central and Eastern Europe. Current es timations state there are 375 Business Process Outsourcing, IT Outsourcing and R&D centers of major foreign companies in Poland. Those include IBM, Google, HP, Microsoft, Nokia-Siemens, Motorola, HSBC, Xerox, Fujitsu, Symantec, Samsung, General Electric – and many more. Last month, the number of outsourced BPO workers alone rose to 100 000, and according to Lasalle report, the Polish outsourcing market is growing at an average rate of 20% per year. Many ventures that started as one-man enterprises changed into leading polish companies. For example, a popular polish nearshore development and IT outsourcing provider PGS Software, rose from three developers at the beginning of 2005 to over two hundred in 2012. Of course, outsourcing is still only a part of the healthy Polish IT sector. The number of local companies is also on the rise, and many of their products have achieved a global success. A good example of this trend is an IVONA software package – while not exactly a household name, this text-to-speech solution was used in many popular consumer devices. Most notably, it powers the text-to-speech capabilities of Amazon’s Kindle Fire. Recently, Amazon decided to acquire IVO Software, but there are many other Polish companies with unique solutions waiting to be discovered. Poland is also an important spot for “AAA” games development. A Wrocław-based developer Techland (of Dead Island fame) and Warsaw-based CD Project RED (creators of Witcher, Witcher 2, and upcoming Cyberpunk 2077) lead the charge into the next generation of video games, with multiple titles announced for new gaming platforms coming from Sony and Microsoft in 2013. • It is the largest outsourcing destination in CEE region. • Salaries of IT specialists are approximately 50% lower than in western EU countries, and one of the lowest in CEE region. • Poland joined EU in 2004. Since then, it managed to adopt many crucial EU norms and legal procedures. It also maintains a healthy, growing economy . • Twelve international airports connect all major cities to business hubs all around the globe. Another good choice in Central and Eastern Europe, Czech Republic is characterized by its excellent infrastructure, close proximity to Germany and Austria, robust economy and a well-educated workforce. Companies that maintain a significant outsourcing presence in Czech Republic include IBM, Accenture, DHL, Sun Microsystems, Exxon Mobil and Siemens. The local IT market also gave birth to some shining stars that can vouch for proficiency of Czech developers. AVG Technologies, producers of the famous free AVG Internet Security Suite, are an example of a Czech developer who made it big time in the consumer market. There are also good examples of successes in B2B space, like Logos, a company that provides technological solutions for T-Mobile, DHL, and Skoda. • According to TripAdvisor rankings, Prague is the most attractive CEE city to visit. Czech Republic also earned the highest score of the region in the quality of life metric prepared for IMD World Competitiveness Yearbook. • Czech Republic is a member of EU since 2004, with a friendly and transparent business environment and a growing economy. • Excellent infrastructure with good land and air connections to Western Europe. The third of our profiled countries, Romania, is a relatively recent addition to the EU, but it’s also a quick-riser with some unique selling points. Most important are low outsourcing costs and cheap properties. Apart from big investments from Adobe, IBM, Oracle, Intel, Accenture and EA Games, Romania also has a lively start-up culture. In 2011, three of its startups were counted by the British Telegraph among top 100 emerging technology businesses in Europe. • It’s the seventh largest country in EU with one of the lowest labor and property costs. • Bucharest, a capital of Romania with population close to 1.7 million, is an important Customer Service and Business Processes outsourcing hub. • The economy is projected to grow by 2.7% in 2014, and by 3.5% in 2015. • Major infrastructure upgrades in recent years. 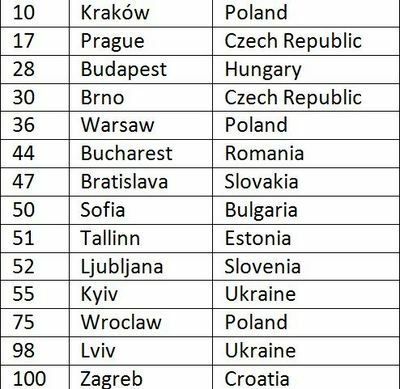 Some other possible outsourcing locations in CEE include Ukraine that managed to increase its IT outsourcing sector tenfold since 2001, Slovakia with its range of incentives for foreign companies, and Hungary with its transparent business environment that ranks 26th globally. They are all a valid choice, picked by many major companies. To learn more about them, I highly encourage you to read appropriate reports. The choice of a specific location is just as important as the choice of a country. So which cities in CEE are potentially best for business? According to Tholons report for year 2013, Central and Eastern Europe contains 14 cities out of 100 best worldwide locations for outsourcing. One of those is in the very top 10, beating such household names as Shanghai, Beijing, Kalkota or Bangkok. As you can see form the table above, Polish cities are in the lead, occupying three spots in the global chart. Czech Republic and Ukraine come in second with two notable locations. The rest of popular Eastern European countries have one major outsourcing center. What’s very important, is that most of the 14 cities lay in close proximity, no more than 1000 km from each other. Together, they form a pulsating core of the Central and Eastern European IT outsourcing market. In 2012, the IT Outsourcing sector grew approximately by 2.1% (source: Gartner). The projected compound annual growth rate from 2012 through 2016 is valued at 5.9%. This data, when coupled with a slow move from the increasingly expensive far-East outsourcing locations to CEE, paints a bright future for the region. With nearshore outsourcing described as one of the top trends of 2013, the outlook for CEE remains strong. It might be a good time for any business to secure a CEE outsourcing partner. I heard Prague is very nice this time of the year, so when visiting, be sure to have a svíčková na smetaně on your way to the hrad. Or maybe you prefer some pierogi on the Wrocław market square? Vampire IT service workers that tell you as it is. "By comparison, the average monthly salaries in top European job markets start at $2589 (Italy) and go all the way up to $4932 (United Kingdom)." £60K average salary for a software developer in the UK? You have to be kidding! There are a few jobs around at those rates, mainly for a small band of specialists with niche skills inside the M25, but outside London the going rate for an experienced senior developer is more like £30-40K, and in many areas it can be as low as £25K, even for somebody with several years' experience. If the average is higher than that, it's probably because that long tail of high London-based salaries is distorting the figures for an industry that is in serious trouble outside the M25, whatever nonsense is spouted by outsourcers trying to squeeze the UK IT profession out of existence. As far as I can see, developer salaries have largely remained stagnant or even declined over the last 10 years outside London (I just applied for a senior dev role on a lower salary than I was earning 10 years ago). At this rate we'll be able to undercut the Poles soon enough. Unfortunately, we still have to pay UK living costs on salaries that are declining every year.